We at Cadillac Cookers strive to build the best looking and best cooking stationary shelf and rotisserie smokers on the market. Our rotisserie smokers, sometimes called rotisserie smoker grills, have a great reputation for producing high quality smoked meat more tender and juicy than meat produced by a high quality flat grill bbq smokers. Our smokers have rotating shelves that constantly turn in the smoker grills cooking chamber. This produces a slow moving air tunnel that in turn creates perfectly even temperatures throughout our bbq smokers. 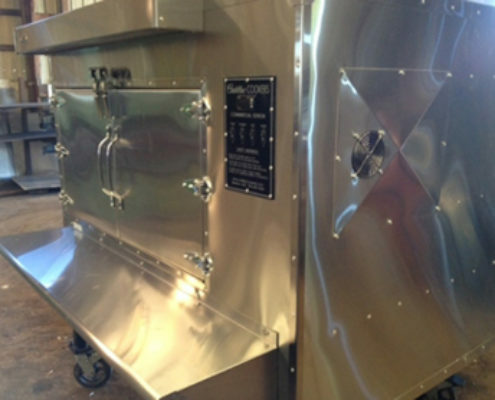 Unlike flat smoker grills, with our rotisserie smokers, there is no need to ever turn or reposition any meat. 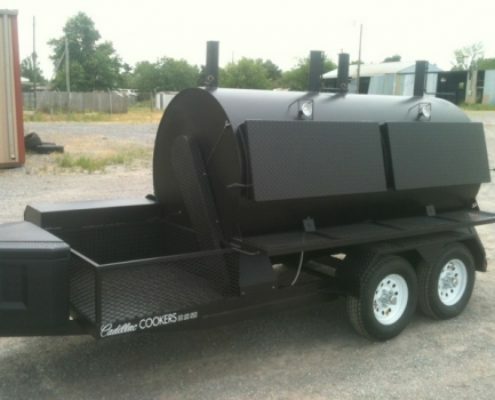 Cadillac Cooker rotisserie bbq smokers have a firebox that runs the entire length of the unit. This makes the heat release perfectly even throughout the smoker grills. All of our cookers also come standard with a warmer box located on the rear of the unit that draws heat directly from the units firebox. The warmer will maintain a temperature of about 160 degrees when the temperature of the cooking chamber is set at a perfect 225 degrees. All Cadillac Cooker rotisserie smokers are made with only the best materials and are painted with a 1500 degree, high heat, paint. Heat Power Coating is also available on most models.